Here are some of the ways you can support our branch. We always have positions vacant for people to help us regularly either with administration, in our shop or directly with the cats. More details of current vacancies can be found on our volunteering page. 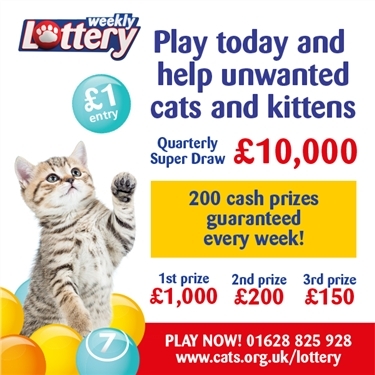 Cats Protecion have a weekly lottery with a 1st prize of £1,000 per week and 200 cash prizes guaranteed. Plus there is a bonus £10,000 prize in the quarterly Super Draw Raffle. It costs just £1 a week and if you nominate our branch when you sign up, all the funds will come directly to our branch to help cats locally. Forms to sign up for the lottery are available in our charity shop in St Neots or we can post one out to you. You can also sign up online at www.cats.org.uk/lottery or call 01628 825 928. Don't forget to choose the branch from the drop down list online or mention our branch if you call. Each draw will take place on a Friday, and the winners list will be available online on the following Monday. The list can be found at www.cats.org.uk/lottery-winners or by calling 01628 201 265. If you’d like to support the branch but don’t have the time or money to do so, there are other ways you can help. We are always looking for good quality bric-a-brac to sell in our charity shop. We don’t sell electrical items or videos but will take everything else from clothes to books, ornaments and jewelry and everything in between! All we ask is that they are in good condition and are clean as we have to pay to dispose of items we can't sell and don’t have the facility to easily wash things at the shop. If you have some items you’d like to donate you can either take them to our shop or call 01480 476696 (Monday to Friday, 9am - 6pm). For large donations please call first. We appreciate that not everyone has the time or means to make donations in person, so we have set up an Amazon Wish list which allows people to make a donation online. Our list includes food, toys and other items we need for the cats in our care. To make a donation from our wish list, click on the link here, choose the item you’d like to donate, add it to your basket and as you check out, select St Neots Cats Protection as your delivery address. The items will be delivered directly to us and distributed to the cats in our care. At any one time we have at least 10 cats staying with us in our cat pens and are feeding over 100 feral or outdoor cats. These cats all need regular meals and as you can imagine this is quite a lot of food! We get a small allocation of free food from our Head Office, but the rest of the food we need to fund ourselves. We are always very grateful for cat food donations. We often get donations from people who’s cats don’t like one flavour in a multipack so if you’ve got a fussy cat or would just like to help feed the cats in our care you can make a donation to our shop or call 01480 476696 (Monday to Friday, 9am - 6pm) for your nearest drop off point. If you shop online, you can raise free donations for the branch with the website Easyfundraising.org.uk. All you have to do is register with Easyfundraising.org.uk and choose our branch as the charity you want to support. Then when you shop online, click through to participating online websites via the Easyfundraising website and your donation will be logged and paid directly into our bank. It doesn't cost you a penny and raises much needed funds for the cats. Click here for more details and to resigister. Can you spare £4 a month? If so would you consider sponsoring a cat pen? Your £4 per month will be used to pay for some of the running costs while cats are staying with us, such as food, cat litter and vets bills. As a thank you for your support, you will receive a certificate, our newsletter and an update of some of the cats your money has gone to help. If you would like to sponsor a cat pen, please either email or call us on 01480 476696 (Monday to Friday, 9am - 6pm) and we will send you all the details. We are still collecting used stamps which are sorted and sold on to raise funds for the branch. If you have usedstamps you would like to send us, please drop them into our shop in St Neots. The scheme to exhange Felix token for cat food closed in August 2015 and we are no longer collecting them. Thank you to everyone who collected them for us.